Police radios used on July 7 2005 were described as inadequate after a training exercise on the Tube two years earlier, the 7/7 inquests were told. The lawyer for some of the victims' families, Christopher Coltart, said the Met Police were "singled out [for] not having any Underground capability". Asked if improvements had been made before 2005, Ch Insp James Strother said he was not aware of any. Four suicide bombers targeted three Tube trains and a bus, killing 52. The inquests into the deaths heard how all emergency services and members of London Underground took part in Operation Osiris on September 7 2003 at Bank Tube station. The hypothetical scenario was a chemical attack on the Underground. Mr Coltart told the inquest: "Following that exercise and the debrief process, all the emergency responders were warned in terms that their radio system was inadequate for responding to a situation almost identical in many respects to that which transpired on July 7." He asked Ch Insp Strother whether the Met Police were "singled out, in a way, in a debrief report from Operation Osiris, of not having any Underground capability and the difficulties which it caused during the course of that exercise were made plain, weren't they?" Mr Strother said: "The only knowledge I have is what I have heard in court." He also said he was "not aware of any attempts to provide any additional technical capability at all". He went on to say that radios were the responsibility of the British Transport Police (BTP). "All I can say is that the Underground was BTP's territory and still is and we would tend to rely on them for the impetus to make improvements in communications," he said. Communication problems hampered rescuers in the aftermath of the bombs, the inquests have heard. They often relied on "runners" to get messages back to ground level. 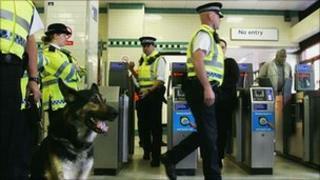 A new system, called Airwave, was introduced after the attacks and allows police officers to use their radios on the Tube network. The inquests, which are due to finish in March, were adjourned until Thursday.